Known as polycaudal (poly = many, caudal = tailed) cats, they should really be called "bi-caudal" (bi = two) as they only have two tails. Since cat lovers were already familiar with polydactyl (many toed) cats, the name polycaudal stuck. Polycaudal cats have been reported in Japan (historical), North America (Canesta, 2005) and Britain (O'Brien, 2005). The trend to create "novelty breeds" based on radical physical changes has led to concern among breeders and veterinarians. This page summarises the information currently available. Bicaudal mutations have historically occurred in Japan where two-tailed animals have entered into folklore. In Japan, vampires can apparently disguise themselves as cats but are readily identified by having two tails. In Princess Mononoke, the giant she-wolf is depicted as having two tails, marking it as a supernatural animal. Bicaudality is therefore not a new mutation. Apart from arousing suspicion among superstitious individuals, the two-tailed trait has not been shown to be disadvantageous. Most cats examined had full control over both tails and could work them in unison, but not independently i.e. both tails were raised, lowered or waved at the same time, but the cat could not raise one while waving the other. Most examined cats showed "tail dominance" where there was greater motor control over either the left or right tail. Consequently, the dominant tail tended to be larger with better muscular development although the secondary tail was not actually atrophied (as shown in this photo). Only in one case did the secondary tail become atrophied and require amputation, although dissection of the amputated tail showed that nervous tissue was incompletely formed (McAuley, Northeast & Dickinson, 2005). The presence of two tails has no effect on the rectal or pelvic muscles and does not affect locomotion. Above the point of bifurcation, the spine appears completely normal. At the point of bifurcation, the vertebrae are mis-shapen and the spinal canal divides into two parts. There may be an unequal number of nerves in the two tails which accounts for the greater control over one or the other. In all but one case, the tails were arranged in a side-by-side orientation. 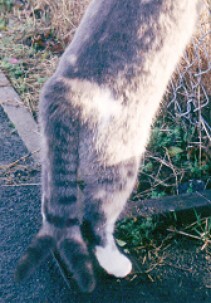 In the remaining case studied, the upper tail was dominant and the lower tail was atrophied and required amputation as it interfered with defecation (the cat being unable to move it out of the way when defecating) formed (McAuley, Northeast & Dickinson, 2005). This latter case, though of interest, has been excluded from the polycaudal study data as it may have been coincidental and due to a different mutation or non-genetic congenital defect. The bifurcation of the spinal column occurs between the pelvis and the tail tip, usually one of the caudal vertebrae, more rarely in the sacral area. The affected caudal vertebra has a roughly conical shape, tapering at the anterior end with one canal entering it and flared at the posterior end where two distinct canals exit. The next vertebra is either twinned or partially fused, resembling a figure 8. The bifurcation may occur in the middle or towards the end of the tail, the latter giving a "knob-ended" or a "T" effect instead of a "V" or "Y". Comparable studies in mice have led to tail types being classified by researchers as "V" (bifurcation close to the sacral region), "Y" (bifurcation along the tail's length) and "T" (bifurcation at the distal end, including knob-ended tails). Incomplete cases of bifurcation cause thickened, flattened tails with loss of tail flexibility and a tendency to arthitis. V-type and Y-type tails have been most commonly observed in mice (Whitelaw, Thornton & Mallory, 1998). Bicaudality and polycaudality are defined as defects by cat fancies. Unlike polydactyly, the trait is not widespread and has rarely been seen in the wild. Unlike the short-legged mutation, which has occurred in various geographical locations, there are no scientific reports of self-perpetuating colonies of cats exhibiting the trait. Although the trait forms part of Japanese folklore, it is classed as a recent mutation and will not be accepted on the basis of being historical. The Manx is an example of a trait accepted for historical reasons; associated spinal problems mean it would not be accepted had it occurred recently. It is anticipated that the general public will latch onto the anomaly for its novelty value and that trademarked "breeds" might arise. Several breed societies have taken the pre-emptive step of drafting a revision to the breed standard to specifically exclude polycaudality from existing breeds. Likewise, several registries are drafting revisions to exclude the trait except in household pet classes; polycaudal HHPs will be subject to thorough veterinary examination and any deficit in locomotion or tail function will exclude them from exhibition. In summary, the trait is strongly discouraged, even in pet cats. All known polycaudal cats are either altered or form part of a scientific experimental breeding programme to determine the mode of transmission of the mutation. None have been released to the public for adoption. Cat fancies and humane societies have called for any cats adopted out from the breeding programme to be altered before adoption to prevent them being used by novelty breeders. The chance of acquiring a polycaudal kitten from known stock is, therefore, practically non-existent. The genetics of the polycaudal trait are not fully understood. So far, most experimental breeding has been between related cats or between unrelated cats exhibiting the trait. There have been few outcrosses to mono-caudal (single-tailed) cats, which have produced only 2 polycaudal offspring among 18 kittens. 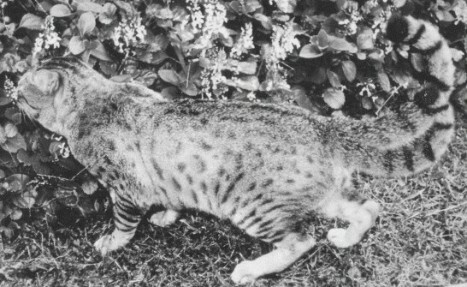 Since the mono-caudal cats were of pedigree stock and known to be free of the polycaudal trait, the trait is believed to be an incomplete recessive i.e. a recessive gene that is unmasked when other genes are present or absent. It is intended to test this hypothesis by breeding the 18 kittens among themselves when they reach maturity. If the gene follows the classical Mendelian pattern (single gene autosomal), all of the F1 generation kittens will be heterozygous for the polycaudal trait, and the F2 generation will include polycaudal offspring (Pfister & Moleshaw, 2006). It is not known whether the gene has deferred lethal effects. This information will be based on litter size data when breeding polycaudal cats or polycaudal carriers together. In mice, the mutation was found to be a variably expressed recessive gene, possibly influenced by modifier genes and this may turn out to be the case in cats. Pfister, W; Moleshaw IJG (unpublished breeding study data, 2006). Read this far? 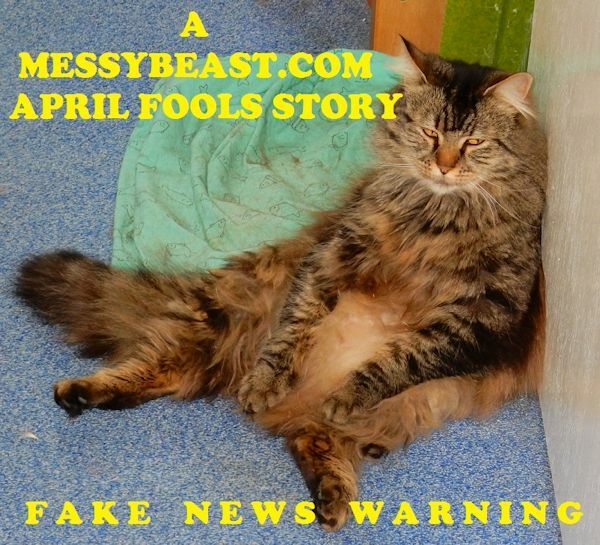 This is the Messybeast April Fool 2006 webpage. Sorry, but there are no breeding populations of multi-tailed cats (or mice).